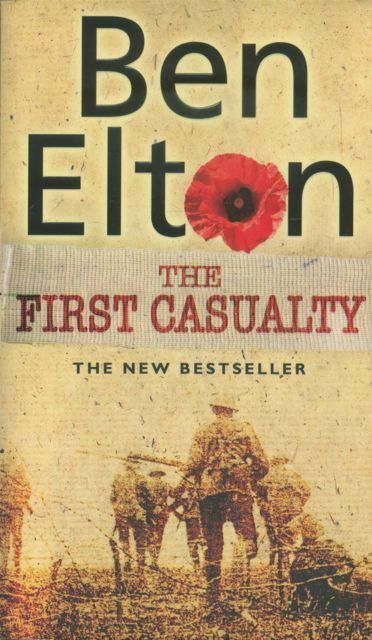 Ben Elton’s 2005 novel The First Casualty clearly advertises itself as a World War I novel. The poppy and the faded sepia photograph of soldiers wearing Brodie helmets are as clear indicators as you can get. But it really isn’t a novel about WWI at all. It’s a detective story – a detective story set against the backdrop of that war. The novel’s hero is Douglas Kingsley, the leading inspector of the London Metropolitan Police who has somewhat lost in popularity since he joined the ranks of conscientious objectors on intellectual grounds and has been sent to prison, where he is not made to feel particularly welcome by his fellow inmates nor by the guards. Perhaps fearing for his safety, Elton manages to pull Kingsley out of prison and drop him in Flanders, where he is to investigate the murder of Captain Abercrombie, a celebrated soldier and poet who upon his return to the front line was sent to a clinic where he was described as NYDN, i.e., not yet diagnosed, nervous. Kingsley arrives in Flanders during the Third Battle of Ypres, or the Battle of Passchendaele, which took place between 31 July and 6 November 1917. Elton gives his readers a bit of a feel for what it must have been like in the trenches and on the front line, but his attention is clearly on Kingsley and his heroic actions as he plunges into the heat of the battle: he may be a conscientious objector, but by God will he go to great lengths to see his investigation through to the end, even if it means killing Germans! But although his heroics are set against a rather brutal reality, it’s not sure how seriously Elton is taking it all. Since the novel is dedicated to the memory of his two grandfathers – who fought on opposite sides in the First World War – one can presume that it’s not all intended as a joke, but the characters are so unreal that it’s difficult to know. But perhaps I’m missing the point: it’s not meant to be realistic or sombre or serious or anything, and the questions raised in the novel as to violence and war and killing and so one are not all that important either: they’re just part of the furnishings. No, with one exception, the novel is pure fiction, pure entertainment, and one that reads well enough, I guess, although I can’t really tell, since I’ve already half forgotten it as I write. There is, however, one short chapter that I do remember and that I like a lot. Paradoxically, it’s a short passage in the opening chapter – at 2 pages, probably one of the shortest chapters in the book. It’s a description of a soldier who is drenched through from the rain and who is slowly making his way along a duckboard before dawn, carrying, on top of all his gear, a heavy reel of barbed wire. As he slowly makes his way, ‘his heavily nailed boot skidded on the wet duckboard and with scarcely a cry he fell sideways into the mud and was gone’. It’s a scene I found hard to believe at first, but when looking at photos of the Battle I see I was wrong. One minute he’s there, the next minute he’s gone. End of story. And the end of his war. Short and unheroic, it’s a more powerful scene than any other in the novel. 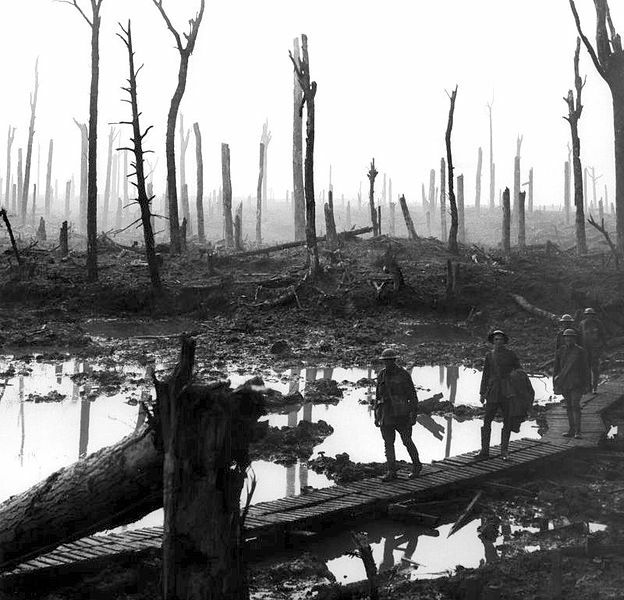 I found this photograph, taken by James Francis Hurley, on the Battle of Passchendaele page on Wikipedia. It shows members of an Australian field artillery brigade in the devastated Château Wood near Hooge, on 29 October 1917. You can find more information on the picture on the Australian War Memorial site here. This entry was posted in Belgium, Fiction set in Belgium and tagged Ben Elton, Fiction set in Belgium, The First Casualty. Bookmark the permalink.